trisher stewart's "putting the hazelnut in the bathtub" cookies, originally uploaded by aarn! +25th October, 2008+. 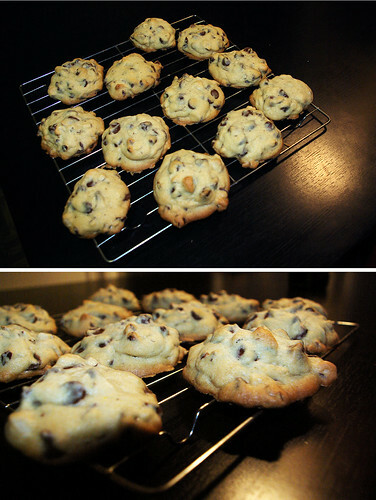 makes three dozen delicious cakey chocolate chip cookie with hazelnuts. preheat oven to 350-degrees. whisk together flour and baking soda and set aside. have aaron mix butter with both sugars and and beat until fluffy. add salt, vanilla, and eggs...add flour mixture gradually. stir in chocolate chips and hazelnuts. drop heaping tablespoons of dough on a buttered baking sheet about 2-inches apart. bake until golden on the edges and set in the center, about 12-minutes. let cool and then see how many you can fit in your mouth when they are still warm.